Snow hill hydrangea, Hydrangea arborescens, is a deciduous shrub. The popularity of these shrubs is easy to understand. They are an attractive landscape shrub with soft gray-green leaves that are 4"-8'in length. It blooms from June to September, providing a season's worth of flowers with very little effort. The flowers are large and showy and are desired as a dried flower as well. One can cut them and enjoy them fresh and then enjoy them all year when dried. They are equally at home in arrangements or a vase by themselves.Hydrangea wreaths can be very expensive to buy, but this shrub is such a prolific bloomer that there will be no shortage of blossoms to make beautiful creations. This shrub has a classic shape and is used in many types of landscape plans. The maintenance is simple. There are no fancy pruning techniques or schedules to learn and follow. Because of this shrub blooms on new wood only, merely cut it nearly to the ground in early spring. Regular watering is all it requires. The soft, white blooms start out as pale green and turn white as the flower matures during the season. This provides some variety without the bother of staggering plants and planting time and figuring out bloom cycles and times. Snow Hill Hydrangea have big snowy flowers. This shrub just keeps them coming. The flowers are big and showy, resembling big snowballs, hence earning its name. Despite the enormous size of the blooms, the branches are sturdy, and the flowers never droop like so many giant flowering plants tend to do. They look lovely in a row, creating an informal border in the yard or as one specimen plant to light up a corner. The night garden glows with this beauty as a centerpiece. Since they bloom well in partial sun/shade, they can look stunning on the side of the house that is shaded by the neighboring homes or large trees. Many growers never fertilize and get remarkable, healthy plants. If you choose to institute a fertilization program, select a balanced slow release fertilizer and use it in early spring and again in the fall. Provide adequate moisture when needed, and hard pruning every spring and the natural vigor of the shrub will do the rest. Snow hill hydrangeas are very easy to preserve by drying if a few basic steps are followed. Make sure the bloom itself is mature. Wait several weeks, at least, before cutting for drying. Strip the leaves from the stems before cutting them. Cut the stems around 12" long and put them in a vase tall enough that the stems are at least halfway submerged. Put the vase out of direct sunlight and let the water evaporate over time. By the time the water is gone, the flowers should be thoroughly dried and ready to use and enjoy. 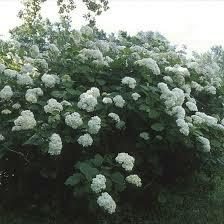 Snow Hill Hydrangea is a deciduous shrub.